Global Non-Alcoholic Wine and Beer Market size was worth over USD 16 billion in 2017 and is expected to witness 7.6% CAGR by 2024. Shifting consumer preferences towards healthier non-alcoholic beverages along with improving living standards are among key factors propelling the market growth. Rapid socialization coupled with enhanced preference in maintaining social status among non-drinkers will stimulate the industry demand. Stress relieving nature of the alcoholic beverages accompanied by hectic schedules and busy lifestyles has enhanced the product adoption. Substantial shifts among the younger population pertaining to the sales of low alcohol or alcohol-free beverages is expected to proliferate the product landscape. As per the beverage daily report of 2017, consumers demand is increasing for non-alcoholic beverages along with more experimental & sophisticated flavours. Cider variant is becoming the fastest growing segment in terms of flavour innovation and low alcohol content. Surging economic growth with the increasing disposable incomes will strongly propel the business expansion. Inclination towards alcohol content reduction in several countries due to increasing consumer health consciousness across the world has resulted in increasing non-alcoholic wine and beer penetration. In 2016, Germany, UK, Spain, Poland, France, and Italy were the top beer consuming nations in Europe. However, according to Brewers of Europe, the total beer consumption in Germany observed a significant decline from 86,018 hectolitres in 2015 to 85,532 hectolitres in 2016. Conversely, the non-alcoholic beer and wine market witnessed significant gains in the European market. Liquor manufacturers are adopting strategies for overcoming the cultural prohibitions on alcohol use particularly in the Islamic countries through alcohol-free wine and beer variants. Upsurge in the popularity of these beverages in the Middle East is anticipated to foster new opportunities to the leading manufacturers. Stringent rules and regulations pertaining to the alcohol consumption age limit in various countries across the globe will fuel the business expansion. Alcohol-free wine and beer are becoming more popular among the millennials owing to the availability for more variants coupled with different flavours. Numerous players across the globe are heavily investing in the craft beer segment. Rising significant innovations in the business will boost the product penetration. Building strong customer base and commercial feasibility will be the key focus for several major manufacturers in the industry. Moreover, challenges in alcohol content limitation in various wine & beer variants and lacking in producing absolute alcohol less variants may pose restraints in the business growth. Hops material will witness CAGR over 8% by revenue in the forecast period from 2018 to 2024. Rising demand in appropriate flavour amounts & variants owing to the extra foam formation for enhancing the creaminess in the beverage is the key impetus for the non-alcoholic wine and beer industry. Hops provide excess protein removal in the unfermented conditions and act as a natural preservative ingredient. Hence, increasing consumer preferences for the non-alcoholic beer variants will propel the growth for the industry. Malted grains market generated revenue over USD 10 billion in 2017. Key manufacturers in the industry are focusing on acquisitions & mergers as a strategy to excel in the non-alcoholic wine and beer segment. Other prominent companies are increasing their geographic presence in the emerging countries for building a strong consumer base. Industry players are focusing on implementing business expansion approaches positively influencing the product positioning. Alcohol-free wine and beer segment accounted for over 2 billion litres in 2017. Growing health consciousness towards cardiovascular diseases and inappropriate drinking habits will be the key impetus for the business growth. Alcohol-free wine and beer contains approximately 69 calories and alcohol content less than 0.5% alcohol by volume (ABV). Surging health awareness offering benefits & suitability pertaining to the alcohol-free beverages consumption particularly among the sports athletes and pregnant women across the globe will foster the industry widening. 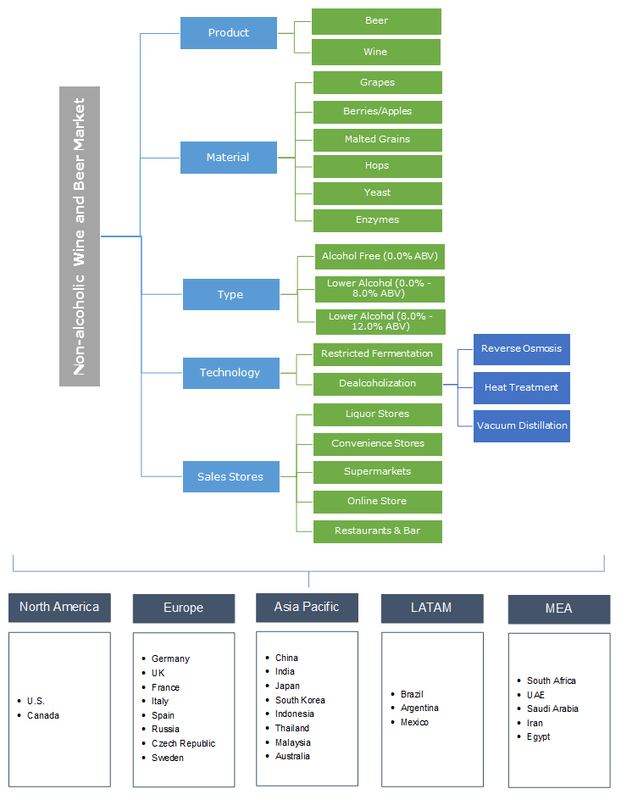 Low alcohol market generated revenue over USD 6 billion in 2017. The growth can be credited to factors including increased wine consumption among women, rising focus on health concerns, growing new wine variants and increase in the domestic wineries. Low alcohol wines are rich in antioxidants and provides compliance with the drunk driving laws owing to the mild after affects. Moreover, growing stringent regulations pertaining to the various yeast strains activities for limiting alcohol content in the beverage will significantly support the production for low alcoholic wine and beer. Dealcoholization technology will witness a CAGR over 7% by revenue over the forecast time. The technology includes heat and membrane-based processes such as heat treatment methods, reverse osmosis, and vacuum distillation. Alcohol is removed effectively on single pass using the stripping mechanism under low temperature and pressure. Hence, overall operating cost reduction in the process will enhance the demand for dealcoholisation technology among the largescale manufacturers. Restricted fermentation technology demand will surpass 800 million litres by 2024. The growth can be attributed to benefits such as limiting extra yeast with adding specific strains offering control over yeast contact time & temperature, thereby restricting the ethanol formation will boost the segment growth. Liquor stores sales channel valued for over USD 4 billion in 2017. Growing multivariant & high-class liquor stores particularly in the developed European countries such as France, Italy, Spain, and UK will boost the non-alcoholic beer and wine market penetration. Major population share consisting of middle-class working people offering large potential customers owing to easy accessibility to the liquor stores. High availability of the multiple variants in wine and beer category coupled with special discounts, promotional offers and reduced prices will fuel an upsurge in the liquor stores expansion. Online stores revenue will witness over 8% CAGR from 2018 to 2024. Changing consumer shopping trends including the ease of comfortability among the geriatric population and rising e-commerce accessibility are driving the non-alcoholic wine and beer market. Surging innovations in the digital distribution media is promoting faster interaction & communication between the companies and their consumers. Europe non-alcoholic beer and wine market demand registered over 1 billion litres in 2017. The region is among the major consumers of alcoholic & non-alcoholic wine and beer across the globe. Presence of key liquor manufacturers and large-scale breweries in France, Italy, Germany, and UK coupled with the high adoption rate among the consumers are driving the positively influencing the product penetration. Rapid advancements in the liquor processing technology & manufacturing equipment owing to an upsurge in the machinery suppliers will proliferate the segment expansion in the region. Asia Pacific non-alcoholic wine and beer market size will worth over USD 7.5 billion by 2024. Substantial economic development along with the rising disposable incomes will boost the regional size. Rules and policies pertaining to tagging non-alcoholic wine and beer with halal tag will result in the significant contribution to the development in the segment. Rapid emergence of the new players owing to the strict alcohol usage laws particularly in the Islamic countries will stimulate the industry widening. 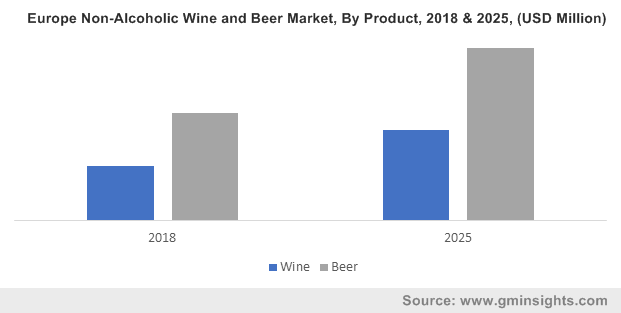 Non-alcoholic wine and beer major market players include Carlsberg, Heineken N.V, Bernard Brewery, Anheuser-Busch InBev, Moscow Brewing Company, Suntory, Erdinger Weibbrau, and Big Drop Brewing. Other prominent industry participants include Weihenstephan, Kirin, Arpanoosh, Coors Brewing Company, Pierre Chavin, and Behnoush Iran. Business strategies such as acquisitions, mergers, and strategic alliances along with various joint venture opportunities will further strengthen and improvise the global presence and consumer reach. For instance, in February 2018, Carlsberg acquired Olympic Brewery, the second largest brewer in Greece. The acquisition will in return strengthen the company’s footprint & brand positioning in the Southern European region. Non-alcoholic wine and beer consists low or no alcohol content. Raw materials used in the manufacturing process includes grapes, berries/apples, malted grains, hops, yeasts, enzymes and other ingredients. Manufacturers and breweries use different processes including restricted fermentation and dealcoholisation for removing the maximum alcohol content. Distribution is carried out using various sales channels including liquor stores, convenience stores, online stores, supermarkets, and restaurants. Key benefits including low calories, reducing cardiovascular disease risks, and reduction in insomnia are the driving factors for the growth in non-alcoholic wine and beer market.